Aloha Garden of Peace | Love is what we are here for! We have a home design we like! This year, Mark and I went to Burning Man for the second year in a row. On the way home from Burning Man, Mark made a decision that he would like to design and build a home before the year ends. We have been working on home designs almost every day since. We have made much progress! 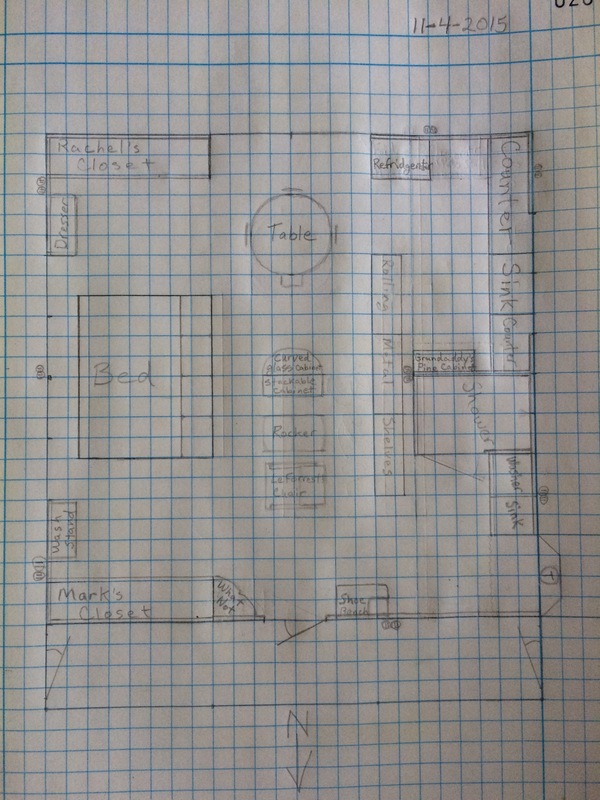 We have come up with a floor plan that we both love! It is small but it will meet our needs for the time being. We are planning to apply for a building permit as soon as our plans are complete. We were thrilled to learn that composting toilets and graywater systems are legal in the state of Hawaii! We have sent our plans to a draftsman and engineer for comments and suggestions. We intend to build this home without a mortgage. There is certainly an abundant expression of good here at the Aloha Garden of Peace!! Two days ago, fence was put up in front of our first lot. We harvested two pineapples from our property, and a neighbor brought another pineapple as a gift! Our wedding anniversary is today!! and the same neighbor will be taking us out to the neighborhood pizza place tonight. This morning, we got our truck repaired in a major way! We replaced the radiator, the water pump, the belt, and spark plugs. It is running MUCH BETTER! On Sunday, we will have a potluck picnic in Kalakaua Park. That is the same park in which Mark performed his first play, Measure for Measure, a dark comedy by Shakespeare. Working on a design for a Green Screen House! I am so excited! The past several days have been really rainy here in Hawaii!! This is good because we had several weeks without any rain. I was notified that a tent is coming our way. Mark and I have spent the past 2 1/2 days in our truck designing a structure that will encompass and protect this new and very helpful bedroom and screened lanai. I am so excited!! Nastus Elatus bamboo coming soon to the Aloha Garden of Peace!! Mark has been hoping to get some of this bamboo for a long time! Some friends of ours have let us know that we can have some of theirs. Mark harvested a few baby shoots :))﻿ last Tuesday and we planted them in mulch on our property the same day! Hi Friends!! It has been so long since I posted. Tonight we went to an amazing presentation by Josiah Hunt, the owner/CEO/director of Pacific Biochar (see pacificbiochar.com). He has been making biochar since 2007 or so. Having just 5% of biochar in your soil can increase production by 17-25%! It was a great presentation! The presentation was at Hawaiian Sanctuary and is part of a yearlong series. This is the third one I have been to. These are exciting times at the Aloha Garden of Peace! I (Rachel) have been home for almost 3 weeks now and we are making steady progress! I hope all of you had a wonderful Thanksgiving! Mark and I visited with friends and enjoyed lunch and dinner at two different parties. At the first one, a good friend of ours encouraged us strongly to be getting free mulch every day that we go into Hilo. We agreed that we need to do this, and in addition, have mulch delivered to us to fill in some big pukas (holes). We built a dog house for Honua, (a puppy Mark got in July) using materials on hand: pallets, plywood, metal roofing, 2x4s, a tray, and a synthetic dog bed. We set up a cooking station and have been cooking 1 meal per day, often including rice, lentils, soup, & veggies. We are still having raw fruit for breakfast and sandwiches for lunch. I walk Honua almost every night, usually about 2 miles, sometimes 3 miles if there is time. When I got back to the Big Island, I found that Mark had set up our camping tent (which lets in ventilation and light! YAY!) under a carport with a tarp. Our camping tent is situated on an 8 X 8 platform about 18 inches off the ground. Inside are two mattresses, making for a comfortable bed. Best of all, we can wake up early and see the sunrise from our bed! Monday of this week, Mark cut several (maybe 10?) trees down with his chainsaw. While working with him near the front of our property, I was eager to have a home for all our tools, so I suggested that the next day we repurpose our Big Max Garden Shed for… TOOLS! It took all day yesterday, but we began and made significant progress on this project. We got all the tools out of our big tent and all the stuff that was in the garden shed out. What to do with the large plywood box that Mark had made for our bed was pondered. We decided to put top of the bed against the wall and stand the bed frame upright near the door on the right as you enter. The bed frame that Mark built is now a garden tool closet! Today’s work when I get home is to get our garden tools out from under our big tent and put them away in their new home. Also wonderful was that I was able to merge and organize all of Mark’s tools and my tools. This is huge :)! Another major benefit of this is that the aisles of our big tent are much better! I am so grateful! Another news item is that very soon I will have a nursing website through my brother Gabriel’s Share the Practice server up and running! Testimony of neck pains healed! I experienced Love’s grace tonight! Just before lunch, while contra dancing with 300 other people, I fell hard, so it seemed, on the gym floor. It took me a while to really be pain free, but I danced the whole day, anyway, and didn’t miss one dance (except for when I helped set up snacks). Every dance has one partner and lots of neighbors. With every partner and every neighbor that I danced with, I asked how they were. When they asked me, I answered honestly that I was grateful to be there, that God is so very GOOD and Life is great and I was thrilled and delighted to be dancing! By the beginning of the evening dance, I could tell the partner that I was dancing with before lunch that I was completely pain free! He and several others rejoiced with me in this freedom. I was also bold enough to voice the Truth to those with challenges that they seemed to be dealing with. God is sooo good!! I thank God for the strength and grace to dance and my mother for her support and prayers! Now as it is after 1 am, it is high time I went to sleep! There will be another 12 hours of dancing tomorrow!!! Much love and gratitude to God and the UNIVERSE!! Epilogue: I was able to enjoy the dancing Sunday as well, again completely pain free. This alone was quite a demonstration as many dancers would sometimes tell me of their [seeming] pain. As mentioned before, I boldly shared the Truth with them and they told me that they appreciated the help. Thank you so much for these GLOBAL, all-encompassing services!! I love them so much and I am sooo grateful that the time allotted to listen to the replay has been extended!! Thanks again!